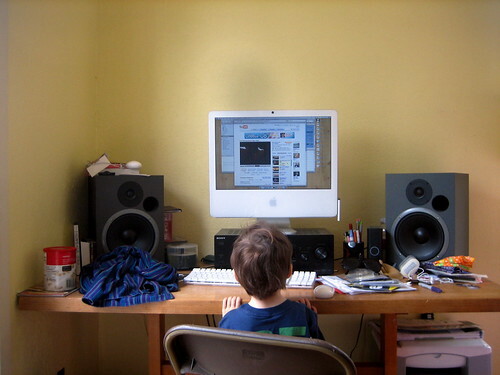 A child watches YouTube: is it in the hands of responsible adults? CC-licensed photo by Steve Schroeder on Flickr. A selection of 10 links for you. Hacking your attention. I’m @charlesarthur on Twitter. Observations and links welcome. Rather than revamp its recommendation engine, YouTube doubled down. Stunning piece of work by Bergen. There have been plenty of disaffected ex-YouTube staffers visible on Twitter, but he has pulled together the story of how money was allowed to trump safety. A decade ago, we spoke with a small handset maker in Shenzhen who sold into China’s domestic market and a half dozen random emerging markets (Ukraine, El Salvador, Uruguay, etc.). His business was always cutthroat, shipping largely $25 feature phones and $100 smartphones. Unfortunately, he did not have enough resources to be able to build his own brand. (He tried; over the years we brought him a dozen marketing text books.) At one point, he tried offering his own software service – messaging, contacts, etc. But he knew that the only path to revenue for these was through selling customer data to ad brokers and others. He told us that his customers would not mind because many of them lived in markets where the government already intruded on users’ privacy in many ways. To his credit, he was very uncomfortable with this business model and did not pursue it. He went out of business five years ago. However, for the majority of the industry, the hard, cold reality is that handset profits are non-existent. And the only way for these companies to remain viable is to sell out their users. The only exception, he notes, is Apple, which of course collects all the profits. Q: In what ways did your dad change [as Disney’s stock took off], other than having a jet? AD: Actually, having a jet is a really big deal. If I were queen of the world, I would pass a law against private jets, because they enable you to get around a certain reality. You don’t have to go through an airport terminal, you don’t have to interact, you don’t have to be patient, you don’t have to be uncomfortable. These are the things that remind us we’re human. Fascinating interview; she sounds like a really nice person. On Saturday, Alessandro Acquisti, a behavioral economist and privacy researcher, said he won’t be serving on the council. “While I’m devoted to research grappling with key ethical issues of fairness, rights and inclusion in AI, I don’t believe this is the right forum for me to engage in this important work,” Acquisti said on Twitter. He didn’t respond to a request for comment. …Some AI experts and activists have also called on Google to remove from the board Dyan Gibbens, the CEO of Trumbull Unmanned, a drone technology company. Gibbens and her co-founders at Trumbull previously worked on U.S. military drones. Using AI for military uses is a major point of contention for some Google employees. Couldn’t they have had “board splinters” in the headline? Children and adolescents don’t yet have the capability to stop doing a rewarding activity and move on to something less fun, neurologists say. That doesn’t mean a child is addicted to videogames. Although experts say children with depression and anxiety are more prone to immerse themselves in games as a coping mechanism, it’s just generally hard for most kids to stop. There are ways for parents to hack this problem, but first they have to understand their kids’ minds. “What’s happening in our brains is that there are systems that evolved to sustain our interest. It will lead you to seek food for days until you find it, and that’s followed by satiety,” said Nora Volkow, director of the National Institute on Drug Abuse at the National Institutes of Health, who has studied similarities between the effects of gaming and substance abuse. Pulling the plug in the middle of a videogame—before a child has had the chance to feel satisfied by completing a level or mission—is a bit like yanking a half-eaten donut out of someone’s hand. The anticipation of playing videogames results in a roughly 75% boost to baseline dopamine levels in the brain, according to Chris Ferguson, a psychology professor at Stetson University in DeLand, Fla., who has analyzed studies on gaming. That’s far less than the boost associated with doing hard drugs, according to data from the National Institute on Drug Abuse, but it’s not much higher than the boost that comes from that donut. Eating the donut is a finite act, however. Videogame makers build in a stream of intermittent rewards to keep people playing. In some games, there’s no real end or it can take hours to achieve. Have rules on time spent, stick to them, that’s about it. [Pakistan social media campaigner Hanzala] Tayyab, 24, spends his days on Facebook and encrypted WhatsApp chatrooms organizing members of his Pakistan Cyber Force group to promote anti-India content and make it go viral, including on Twitter where he has more than 50,000 followers. Lovely, delightful social media. Connecting the world. Now that would be a truly scary thing to have to deal with. Some of these product shutdowns have transition plans, and some of them (like Google+) represent Google completely abandoning a user base. The specifics aren’t crucial, though. What matters is that every single one of these actions has a negative consequence for Google’s brand, and the near-constant stream of shutdown announcements makes Google seem more unstable and untrustworthy than it has ever been. Wellll.. as someone who once tried to catalogue all the Google products and services that had opened, closed and/or survived (the mean lifespan was 1459 days, ie just under four years), I can’t say that many of these closures have harmed my opinion of the Google brand. Though I did think then that it would harm developers’ view of Google services’ reliability. Perhaps this is a trope. But is it true?